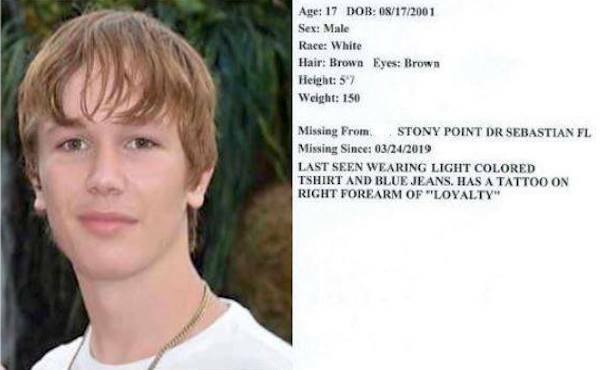 Police are asking for help in finding Tommy James York, 17, who is an endangered runaway in Sebastian, Florida. SEBASTIAN – Police are asking for help in finding Tommy James York, 17, who is an endangered runaway. York has been missing since Sunday, March 24, 2019. He was last seen off of Stony Point Dr. in Sebastian wearing a light colored t-shirt and blue jeans. York has brown hair, brown eyes, stands 5’7 and weighs 150 pounds. If you know the whereabouts Tommy James York, please contact the Sebastian Police Department at (772) 589-5233 and ask to speak with Detective Sgt. Finnegan.